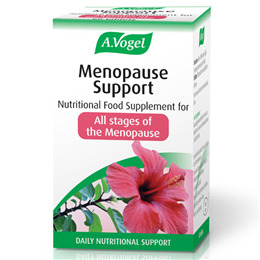 A Vogel Menosan Menopause Support - Before, During & After is a formulation made for women. Includes extracts of fermented soya beans. Formulated with magnesium, A Vogel Menosan Menopause Support also includes hibiscus extract and vervain essential oil. Tri-magnesium dicitrate anhydrous, fermented soy bean extract (60% isoflavones), Hibiscus extract, Vervain essential oil, microcrystalline cellulose, Beta vulgaris (beetroot juice) powder, hydrogenated cottonseed oil, elemental magnesium. Adults: Take 1 tablet twice daily (morning and evening) with food. Do not use if pregnant, breast-feeding or when using hormonal contraception. Below are reviews of A Vogel Menopause Support - 60 Tablets by bodykind customers. If you have tried this product we'd love to hear what you think so please leave a review. Having got a trial pack from A.Vogel I found this seemed to help my night sweats. Now they are not gone completely, but I can manage to get sleeping a bit longer before one kicks in. I found Bodykind to be the best value for it. I was suffering awful menopause related emotional issues, particularly feeling like I was going to cry all the time; literally had that choked feeling all my waking hours and was crying many times a day, every day. It was ruining my life and making it very difficult to function. Also having massive, if short lived mood swings; massive overeactions to the slightest issue. These tablets helped with these issues within a couple of days. Cannot do without them, reallly, really recommend them. Not having any effect whatsoever. Different products work for different people however this is not working for me so I cannot recommend it. Works miracles..this product definitely eases the hot flushes. Wouldn't do without this product. It just helps with all menopause symptoms. Great product, would highly recommend them!! Love these tablets they really work for me, I tried another brand but they didn't work. Great product and does exactly what it says it will do. Really pleased with results so far for my symptoms which are perimenopausal (according to GP!). Perfect support and balance of supplements to help alleviate menopausal symptoms. I love this product. I ordered a free sample (a supply for 1 week to try from A Vogel) and was truly amazed. I tried a few products before this one that did not work for hot flushes. This is the site I bought my supply because I got the best price here and have stocked up for 6 months and I would say try it and you will be hooked too. A Vogel Menosan Menopause Support - Before, During & After is a unique formulation for women. It includes extracts of fermented soya beans that can help you through the stages of menopause and associated symptoms, such as tiredness and fatigue.